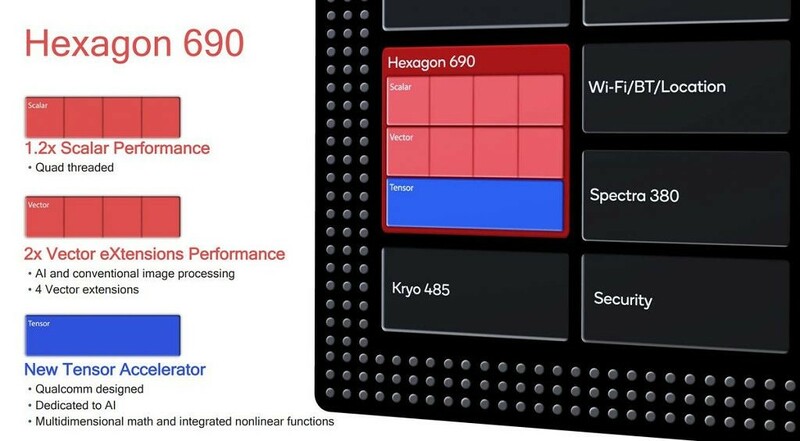 Last month, Qualcomm unveiled the Snapdragon 855 mobile platform. The Snapdragon 855 is the mobile platform that will power most Android flagship smartphones in 2019. Qualcomm has made substantial year-on-year improvements with their next generation mobile platform. The Snapdragon 855 mobile platform is built on a 7nm manufacturing process and offers an impressive 45% jump in CPU performance over the Snapdragon 845. The improvements in computation across the board allow Qualcomm to boast excellent AI performance on the new Snapdragon 855. There’s a lot of information to unpack here and we’ve done our best to show how Qualcomm has improved performance and AI on the Snapdragon 855. 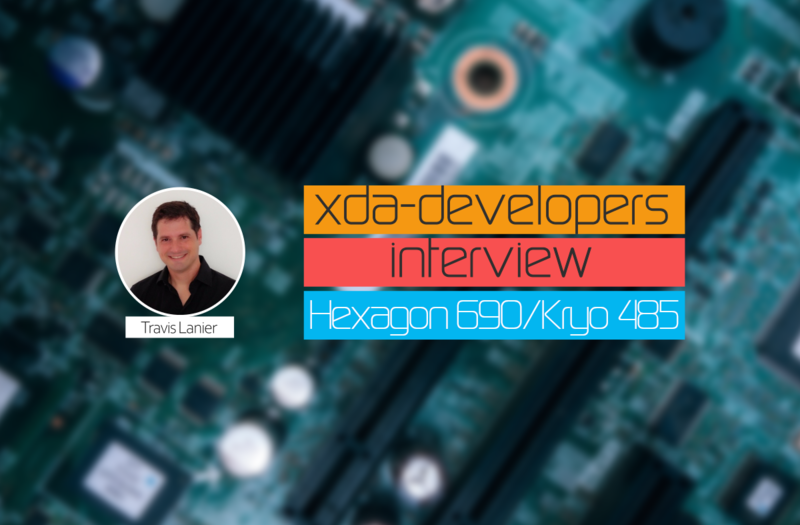 However, we still had questions of our own after the product unveiling, so we sat down with Travis Lanier, Senior Director of Product Management at Qualcomm, to talk about the Kryo 485 CPU and AI on Qualcomm’s new mobile platform. Travis Lanier: “So I can’t really say too much more than other what was in my slides. Maybe at a future date we can, so we can sit down and get some experts who actually did the work; I know the high-level talking points. But as you know, A76 is already a high-level design—it’s pretty good. And it’s one of the reasons when we saw ARM’s roadmap. So I’m like, okay, maybe we should work with these guys more closely, because it looked very strong. And just going back to your comment on customization versus ARM. So okay, there’s all these things that you can do. And if you’re doing something, and it needs to have differentiation, so you can do something a hundred percent or partner with them. And [as in] previous years, we’re a little bit more about integration. So buses, and how we hooked up to the system, their security features that we put into the CPUs, cache configurations. Now that the engagements have been going longer, we were able to do a deeper customization on this one. And that’s how we were able to put some of these things in there, like larger [out-of-order] execution windows, right, so you have more instructions in flight, data pre-fetching is actually one of the areas where there’s the most innovation going on in the microprocessor industry right now. A lot of the techniques for a lot of these things are pretty similar, everybody uses a TAGE branch predictor nowadays, just how big you provision it, people know how to do out-of-order, and forwarding and all that stuff for bigger caches. But pre-fetching, there’s still a lot of, it’s one of those dark art type things. So there’s still a lot of innovation going in that space. So that’s something that we felt we could help with. Travis Lanier: “So let’s talk about different clocks and different voltage planes first. So every time you add a clock and every time you add a voltage, it costs money. So there’s a limit to the number of pins you put on the package, there’s more PLLs you have to have for different clocks and there’s just increased complexity. So there is a trade off to doing things. We went kind of extreme at one point; we had four different domains on four different clocks, so we had experience with that and it was expensive. Kind of when you start to go big.LITTLE, you have the small cores on [the] small cluster and they don’t quite need that same granularity, so to speak, of a separate clock between the small cores. Yes, it’s kind of in the air what you do with those. So when you have a big.LITTLE system, then conversely you have these big cores. Well, okay, do you put each of those on a big clock? Well, you’re not running on those all [the] time, if you’re actually in a low enough situation where a clock unoccupied will run on a small core anyway. So really, it’s kind of two of them is good enough there. Now we have three cores run a little bit at a lower frequency, but they’re also more power efficient. And so like, whenever you—I don’t know how much you know about implementation of cores—but whenever you start to hit the top of the frequency, and the implementations of these cores, there’s a trade off in power, things start to get exponential in those last few megahertz or gigahertz that you have. Yeah, and so I talked about a second ago, where, hey all games are starting to get multithreaded, like all of a sudden, if you look back, there was a couple of games not too long ago, and they’re just using one thread. But it’s weird how quickly the industry can change. Like in the past year, year and a half, they’ve literally started putting all these games into… I’ve gotten excited over these high fidelity games. And so whereas a lot of stuff just even like six months to a year ago, before, it’s actually flipped over all of China. In China, I hear “I don’t really care about big cores, give me a eight of anything, give me eight of the smallest cores so I can have eight cores.” They’ve changed because they want these games, these games require big cores. And now we’re getting feedback from partners that “no, we actually want four big cores,” because of all the advanced games that are coming out. And they’re going to use all these cores. Kryo 485 CPU core configuration. Source: Qualcomm. Travis Lanier: “It goes a little bit back and forth. But in the end, you have to have these engines because the name of the game in mobile is power efficiency. Now you sometimes see it move back to a generalization every once in awhile. If you go back to your original, even for smartphones, feature phones had multimedia and camera capabilities to some extent and so they have all these little dedicated things because you couldn’t do it. If you go back to the phones that are built on the ARM 9 or an ARM 7 they all had a hardware acceleration widget for everything. But to give you an example, where something went general and then now they’re asking for hardware again, would be JPEG. There used to be a JPEG accelerator. The CPU eventually got good enough and it was power efficient enough and the JPEGs kind of stayed the same size that, hey, you know what, we’ll just go ahead and do it on the CPU [as] it’s just easier to do it. Now, as pictures get bigger and bigger, all of a sudden, people are going, you know, actually, I want these really gigantic photo file sizes to be accelerated. The CPUs [are] kind of either not fast enough or burning too much power. It’s just suddenly that there’s interest in potentially having JPEG accelerators again. So it is not always a straight line how things go, then you have to look at what’s going on right now with Moore’s Law. Everyone keeps talking about, hey, you may not be dead, but it’s slowing down a little bit, right? So if you’re not getting that power boost, or performance boost from each next node, how do you continue to put more functionality on the phone if you don’t have that overhead? So you could just put it on the CPU. But if you don’t have more headroom for your CPU, how do you accelerate these things? 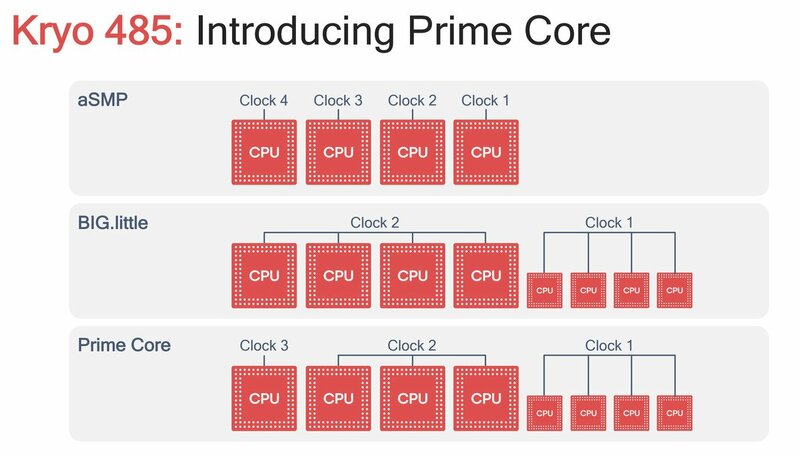 Well the answer is, you put all these specialized cores and things more efficiently. And so it’s that natural tension. 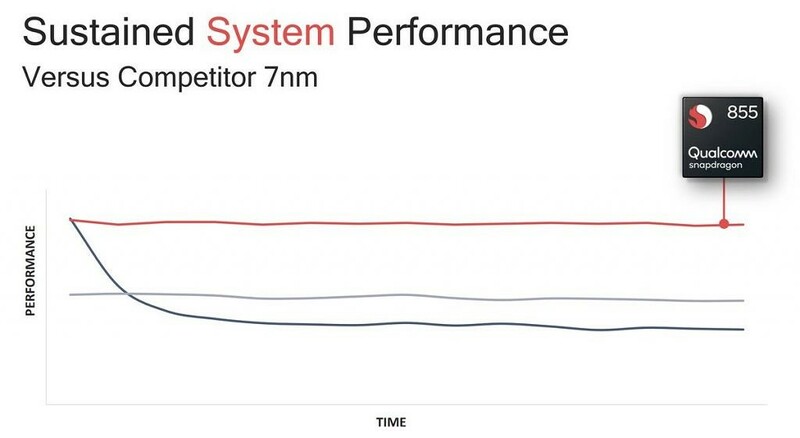 Snapdragon 855’s sustained system performance versus a 7nm competitor, presumed to be HiSilicon’s Kirin 980. Source: Qualcomm. 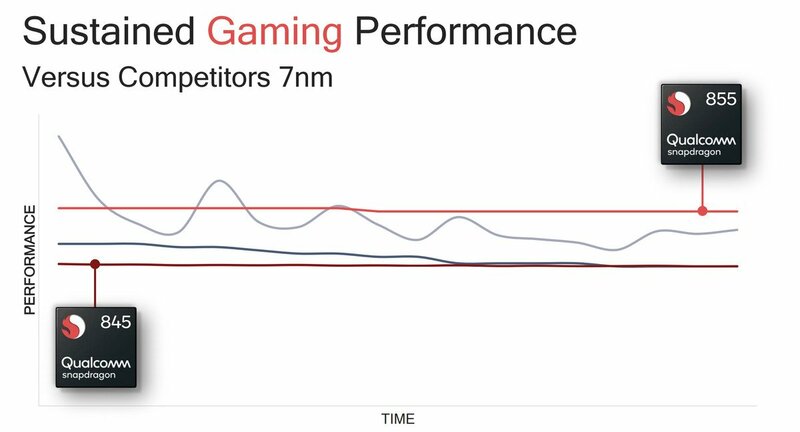 Snapdragon 855’s sustained gaming performance versus a 7nm competitor, presumed to be HiSilicon’s Kirin 980. Source: Qualcomm. Travis Lanier: “Maybe you guys do. You guys are like an outlier. But like maybe one CPU is better on this and maybe one’s better on another. Same thing with SPEC, people will highlight the one SPEC, well, okay, there’s a lot of different workloads within that. And they’re pretty tight things, but even SPEC, which we actually use for developing CPUs, if you look at the actual workloads, are they actually relevant? It’s great for comparing workstation workloads, but am I really doing molecular modeling on my phone? No. But again, that’s my point is, most of these benchmarks are useful in some way, but you have to understand the context of what [it’s] for and how you get there. And so it’s really hard to distill things down to one number. And I see this especially—I’m pivoting here a little bit—but I see this with AI right now, it is bonkers. I see that there’s a couple of different things that wouldn’t get one number for AI. And so as much as I was talking about CPU, and you have all these different workloads, and you’re trying to get one number. Holy moly, AI. There’s so many different neural networks, and so many different workloads. Are you running it in floating point, are you running it in int, running it in 8 or 16 bit precision? And so what’s happened is, I see people try to create these things and, well, we chose this workload, and we did it in floating point, and we’re going to weight 50% of our tests on this one network and two other tests, and we’ll weight them on this. Okay, does anybody actually even use that particular workload on that net? Any real applications? AI is fascinating because it’s moving so fast. Anything I tell you will probably be incorrect in a month or two. So that’s what’s also cool about it, because it’s changing so much. Hexagon 690 Overview. Source: Qualcomm. All graphics in this article are sourced from Travis Lanier’s presentation at the Snapdragon Tech Summit. You can view the presentation slides here.